Saint Peter +/- d.AD 64 was the most prominent of the Twelve Apostles, listed first in the Gospels, and traditionally the first bishop of Rome. His original name was Simon, but Jesus gave him the nickname Cephas [Aramaic,—rock], which was translated into Greek as Petros [Gr. petra —rock]. Peter was a native of Bethsaida and the brother of St. Andrew. He and Andrew, both fishermen, were called by Jesus to be disciples at the same time as James and John, the sons of Zebedee (Mark 1.16-20, 29-31; 3.14-16; Luke 5.1-11; John 1.40-44). His honored position comes out most clearly in two high points of Jesus’ ministry—when Peter confessed Jesus to be the Christ and was told “Upon this rock I will build my church” ; and when he, together with James and John, was chosen to see the Transfiguration (Mat. 16.13-20; 17.1-13). After the Resurrection, Jesus appeared by the Sea of Galilee and charged Peter to “feed my sheep” (John 20.1-10; 21). A few facts of St. Peter’s life are known from 2d-century sources. He apparently left Antioch for Rome c.AD 55; there he died, head of the local church, a martyr under Nero. According to traditional accounts he was crucified with his head downward. From earliest times the Vatican hill has been pointed out as the place of his martyrdom. Constantine erected a church over the supposed burial place of Peter; in the 15th century work was begun on a new, huge St. Peter’s Church , built on the same location. It is the principal shrine of Roman Catholicism. The biblical passages cited to support Petrine supremacy are Matthew 16.13-20 and John 21.15-25. 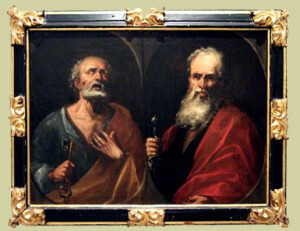 From the first passage comes the familiar image of the keys, which are seen to represent papal power, as well as that of St. Peter as the gatekeeper of heaven. There are several feasts of St. Peter in the West: St. Peter and St. Paul, June 29; the Chair of St. Peter, Apostle, Feb. 22; and St. Peter in Chains, Aug. 1. St. Paul, the indefatigable Apostle of the Gentiles, was converted from Judaism on the road to Damascus. Having returned to Damascus, he stayed there for a time, preaching in the synagogues that Jesus is the Christ, the Son of God. He then went to Jerusalem to see Peter and pay his homage to the head of the Church. Later he went back to his native Tarsus, where he began to evangelize his own province until called by Barnabus to Antioch. Soon after this, Paul and Barnabus made the first missionary journey, visiting the island of Cypress, then Pamphylia, Pisidia, and Lycaonia, all in Asia Minor, and establishing churches at Pisidian Antioch, Iconium, Lystra, and Derbe. After the Apostolic Council of Jerusalem Paul, accompanied by Silas and later also by Timothy and Luke, made his second missionary journey, first revisiting the churches previously established by him in Asia Minor, and then passing through Galatia. On his third missionary journey, Paul visited nearly the same regions as on the second trip, but made Ephesus where he remained nearly three years, the center of his missionary activity. The Acts of the Apostles gives us no further information on the life of the Apostle. We gather, however, from the Pastoral Epistles and from tradition that at the end of the two years St. Paul was released from his Roman imprisonment, and then traveled to Spain, later to the East again, and then back to Rome, where he was imprisoned a second time and in the year 67, was beheaded. In his Epistles, St. Paul shows himself to be a profound religious thinker and he has had an enduring formative influence in the development of Christianity. The centuries only make more apparent his greatness of mind and spirit. His feast day is June 29th. St. Paul is usually depicted with a sword which is a symbol of the ‘sword of faith’ – the weapon against the devil.